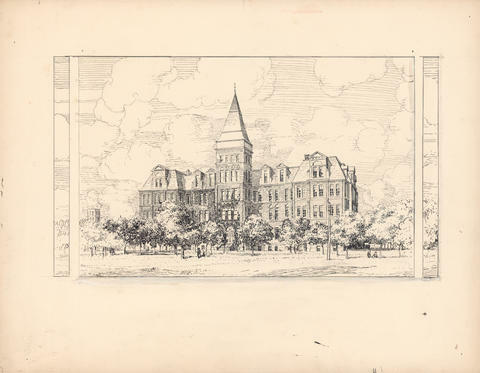 Item is an Arthur Lismer illustration of Dalhousie University's Forrest Building rendered in pen and ink on illustration board; the bottom left corner has the Strathmore drawing board platemark. The image was commissioned for One hundred years of Dalhousie, 1818–1918 (1920) and reproduced in D.C. Harvey, An introduction to the history of Dalhousie University (1938) and P.B. Waite, Lives of Dalhousie University, volume one, 1818–1925 (1994). P.B Waite's accompanying caption—"A Lismer sketch of Dalhousie College as it looked in 1900. Note the growth of the trees since 1887"—suggests that the sketch was made at least in part from observation. Item has minor ink stains and smudges, with tack marks in its corners.